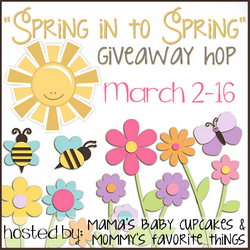 Mama's Baby Cupcakes, Mommy's Favorite Things and the "Spring in to Spring" participating bloggers are not responsible for sponsors who do not fulfill prize obligations. I'd really like to win some Umi shoes. I'd like to win the Umi GC. The umi shoes for my son! 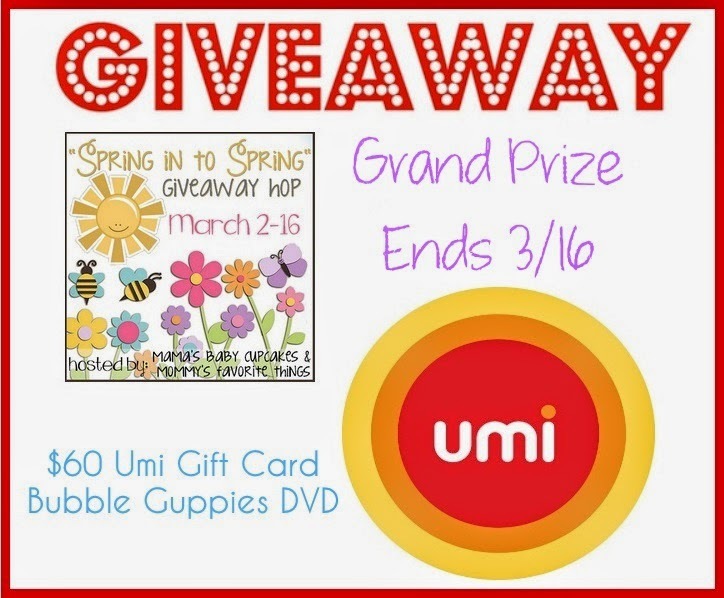 I'm most excited to win the Umi Shoes GC, but my grandsons also love Bubble Guppies so it's a win-win! I would really like to win the Umi shoes. I would love to win the Umi gift card. Thanks! I'd love to win the Umi shoes for my daughter. The Umi shoes for my niece! I would like the Umi shoes. I want the umi shoes! I am most looking forward to winning the Umi Shoes. I'm looking forward to winning the UMI shoes! I'm most excited about the shoes. I would prefer the Umi shoes GC. Super excited about the umi shoes! My kids would love these! Honestly, both! The dvd would perfect the Easter Basket. The Umi gift card would be great for getting each kiddo a new pair of summer shoes. Thanks for the chance. I would love to win the shoes, my daughters feet grow so fast. I love to win anything! These Umi shoes would be awesome. My son needs new shoes. Thanks bunches. I'd love to win the Umi gift card. Would love to win the Umi Shoes Gift Card for a pair of shoes for my grandson. I would love to win the UMI gift Card. The Umi gift card would be awesome. I look forward to the Umi Shoes. I would love to win some Umi shoes for my daughter! Thanks so much for hosting this giveaway! I'm more excited about the Umi prize. Baby needs a new pair of shoes as they say! I am most looking forward to the Umi Gift Card. Of course every one needs bigger shoes. I am looking forward to winning Umi shoes. I'm looking forward to win the Umi shoes. I'm most looking forward to the umi shoes, I've gotten two before in the past and they are great! I would like to win the Umi Gift Certificate. I would give it to my daughter in law to use with my grandson. He seems to wear a bigger shoe size with each passing week. Most looking forward to winning the Umi gift card! I am most looking forward to winning the UMI shoes GC because my grandson needs a new pair of shoes. I most look forward to possibly winning $60 Certificate to umi shoes! I love their shoes! Umi Shoes! I have been wanting to get my daughter a pair for so long! I'm excited about the Umi GC!!! I'm most looking forward to the shoes... my daughter needs a good pair for spring/summer! I would love to win the Umi shoes for one of my grandchildren. I'd love to win the Umi gift certificate. I'd like new shoes for my girls but I'm sure they'd be more excited about the DVD. I am most excited about winning the Umi gift card so I can buy my grandson some shoes. I'm looking forward to win the Umi shoes they are all so cute. The Umi Gift code will come in handy for summer shoes for my son. Very excited for the Umi shoes, it's crazy how fast kids go through shoes! id love the umi shoes!! I would love to get the Umishoes Love the shoes.. I have been wanting to try the Umi shoes for a long time, so I am most looking forward to that prize. I'm excited about the $60 Certificate from Umi to be able to get new shoes for my grandson. I would love to get my daughter some new dress up shoes! So the Umi Gift Certificate! I'm most excited about the $60 Certificate for Umi shoes! 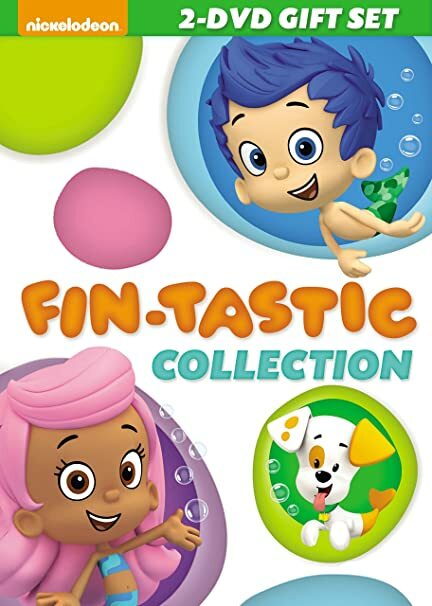 I am most looking forward to the Bubble Guppies DVD and it is my kids favorite show.